I absolutely fell in love with the interior below, it's grand presence and mix of textures from the sage green velvet cushions to the simple glass candlesticks and votive's. 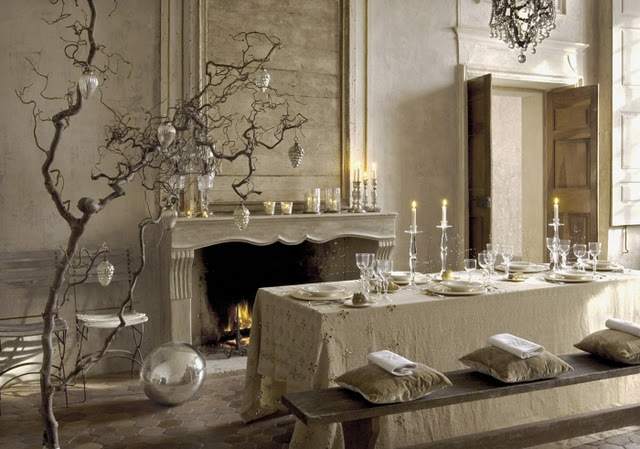 To keep with the subtle tones of the room a branch of willow has been used as a simple Christmas tree. 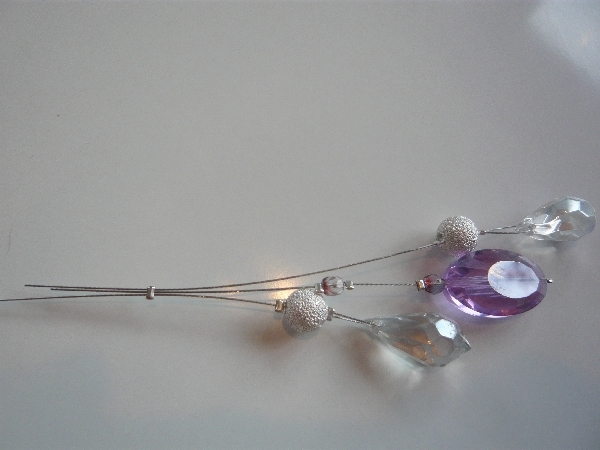 Mercury glass baubles hang delicately from it's branches. Simplicity is how I would describe this setting with an air of "elegance". 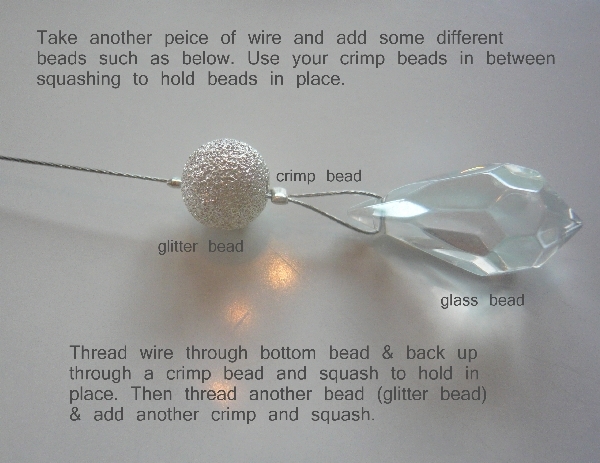 Inspired by this image I was going to show you how to re-create some mercury glass baubles but when I went to buy the empty glass baubles I saw a really pretty bauble in the Bead Hold (a beading shop). 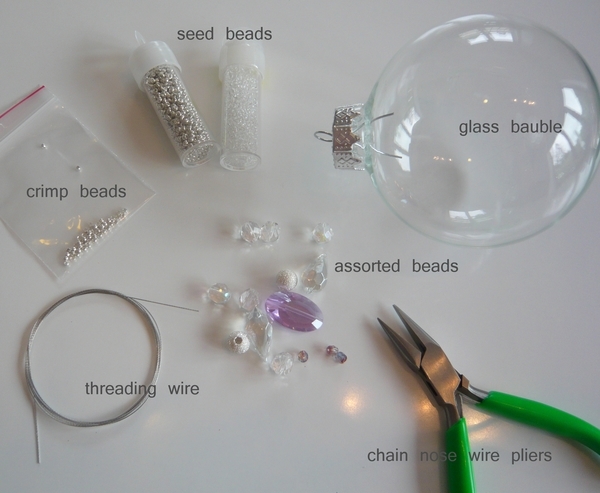 I gathered up some pretty mauve crystals, silver beads and some clear crystals while I was there to make my bauble as seen below. 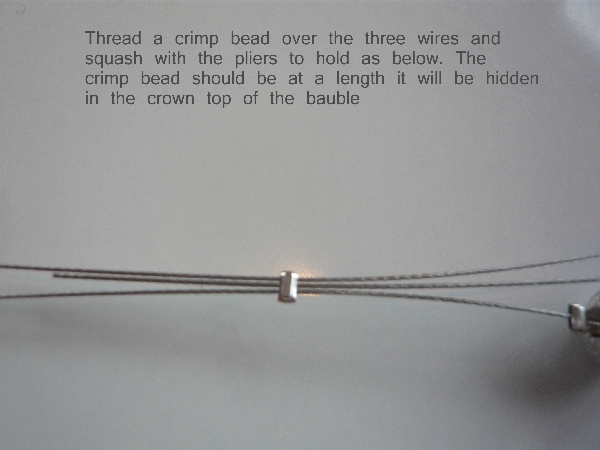 I hope my instructions are easy for you to follow to create a keepsake bauble for your own tree or wherever you may want to hang it in your house. 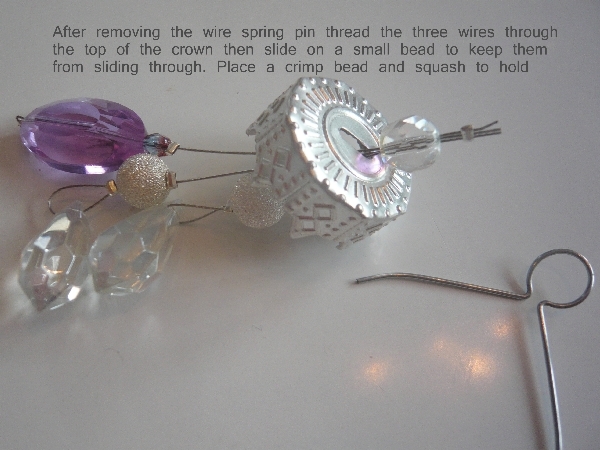 Trim off the excess wire with scissors. Replace the spring pin and tie a pretty ribbon around the top of the pin. I have used leftover ribbon from my Christmas table setting. I think some gorgeous wired chintz would be really pretty as you could create a wonderful bow. tube should be plenty as they just lay in the bottom. 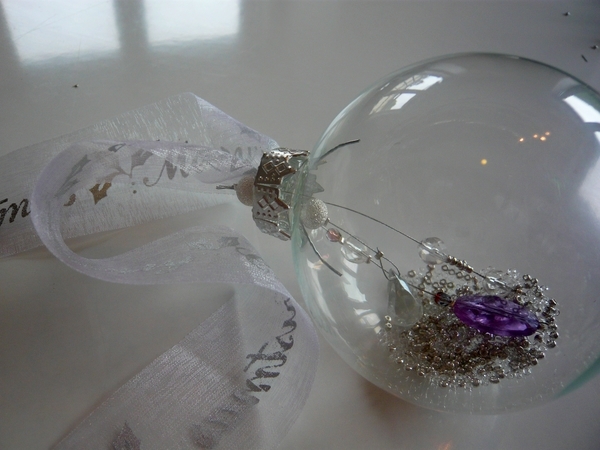 Replace the crown lid of the bauble and secure it and you have yourself a really pretty keepsake bauble. As a different colour variation you could use gold and black seed beads to scatter inside the bauble, crystals and black beads for the dangles and a gold or silver wired chintz ribbon for the bow. 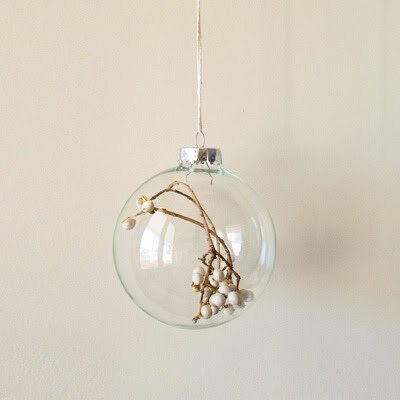 Alternatively you could have a more "natural" theme with hemp ribbon and white wooden beads on your wire and a small shell on the end and tiny crushed shells or white sand in the bauble. 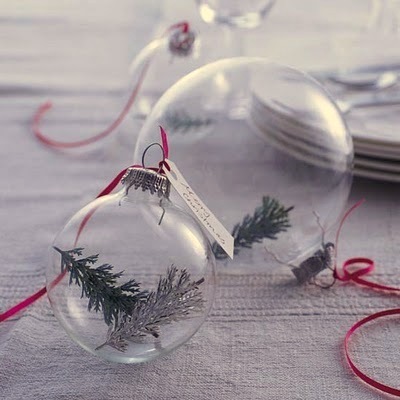 Here are some simple image ideas to fill your bauble if you want a simple but pretty effect. 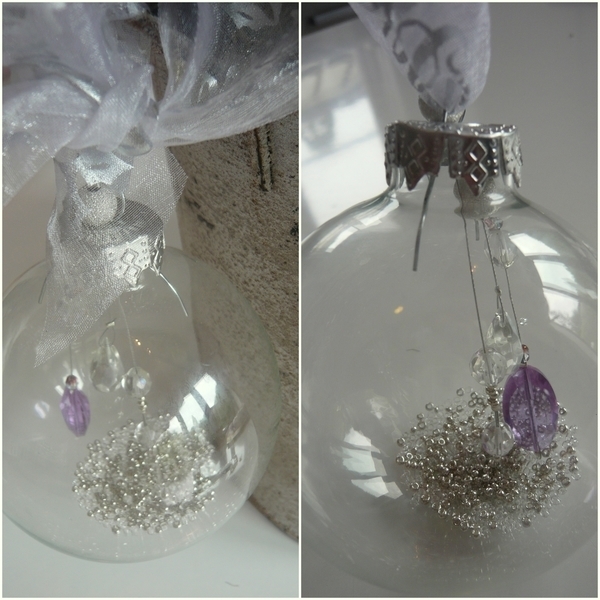 These beautiful baubles are for sale at Pipii - British Pounds 6.00 each. 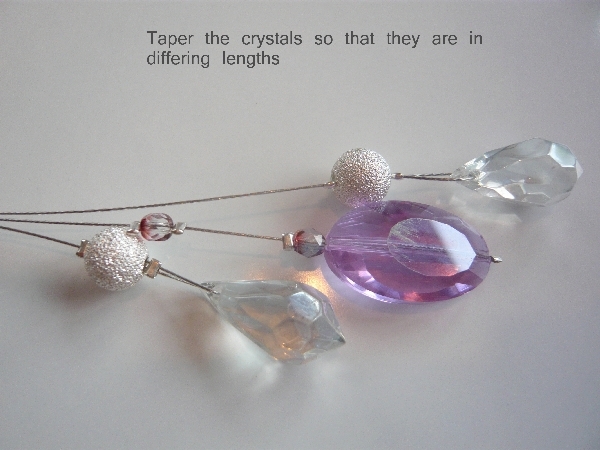 However you could easily glue Swarovski crystals to the outside of your baubles or even small embellishments to re-create something similar. Your Christmas tree bauble are Gorgeous !! Thanks so much for showing me how to put them together so sweet of you. I hope you and your family have a wonderful week. And thanks so much for your sweet commennts on my new Blue Tablescape. Hello! So glad I found your blog! 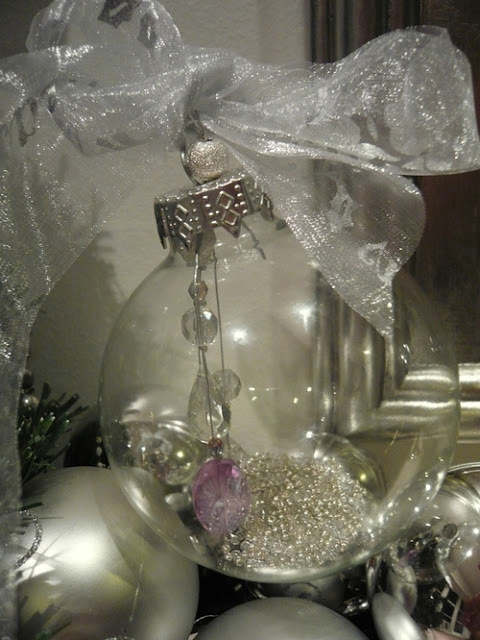 I love the elegant ornaments you've created! So very beautiful! I have enjoyed my visit to your blog and am your newest follower! A lovely idea. 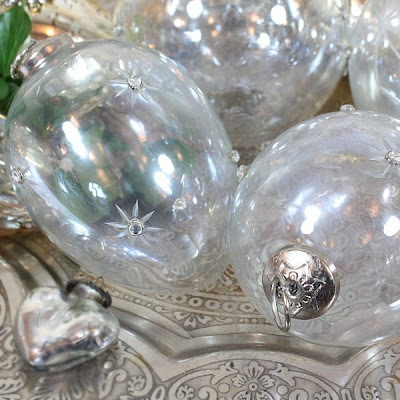 I've been looking for glass baubles as I wanted to put small sepia (or black and white) photos of my relations and friends (no longer alive) to hang on my tree to remind me of them each Christmas. After seeing your post I'll probably add some beads and ribbons (to match thier personalities) too . Thank you Diane and Kathy for your comments, please come back again as I will be featuring some really pretty and elegant Christmas crackers to make. I really like these baubles. So pretty. They are on my must make list for next Christmas. PS When I made the feather tree Gus ran around with the loose feathers I dropped. It looked so funny - a jet black schnoodle with white feathers in his mouth! Oh gosh you have a schnoodle too, what a co-incidence. I can picture Gus easily as my teeny weeny Poppy is jet black too. Glad you like the baubles, I have some great ideas for baubles next year too. I just like the word baubles! Why don't we call them baubles here!? Ornaments does not sound as fun or pretty. They ARE very pretty and I haven't seen any like them so far. I love that they are elegant ~ even though they are "homemade". 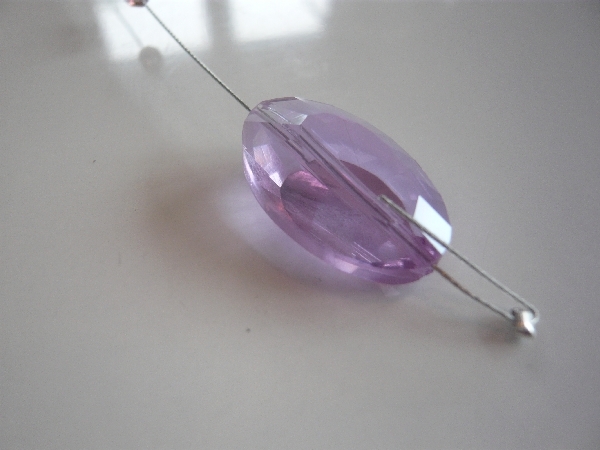 I have six of these clear glass baubles but haven't been able to decide what they should become. Yours have given me more inspiration. I didn't see your comment, sorry I am pretty late responding to it. Yes baubles I think is an English word. I am glad you found some inspiration here to fill your baubles. 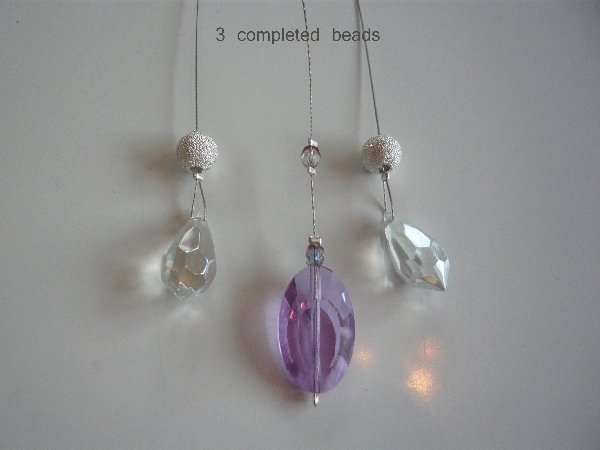 Hi Elaine, I purchased mine at the Bead Hold in Pt Chev, however they have since closed and I think have an online store at http://www.beadhold.co.nz/ I did look on line and couldn't see them so I would give them a call as they definitely had them in their store. Otherwise phone Spotlight if you have one near you. Sorry about that Elaine, but definitely the bead hold had them in their Pt Chev shop. Now they are only on line, I couldn't see one but I suggest you contact them as they may only have them at Christmas time. Otherwise I found some here: http://www.save-on-crafts.com/chrisorbrchr.html Not sure if they will send overseas you could check. I emailed the bead place and they don't stock them.Reckons spotlight will have them nearer to Xmas.Thanks anyway. I have never done this but found a video on youtube that might help you, if it isn't suitable just put your question into 'Google' search engine as it came up with a few resources. Copy and paste the link below into your browser for the video. I can't remember exactly as they are packed in the attic but approximately 3 to 3.5 inches in diameter. If you want to upload a photo go to your Pinterest account, you will need to have one first you can set it up for free. If you have one already then go to your page, pick a board you want to upload it to, click on the board then click on "add a pin" you will see an empty box to the left hand side. Click on this and then it will give you a choice, you pick "pin from your device" and then click on that and it will then say "upload a pin", you then click on that and it will take you to your computer where you choose the image. Best to save it onto your desktop first so it is easy to find...Good luck and when you do if you add me as a follower you can then send me the pin through Pinterest by sharing it with me.